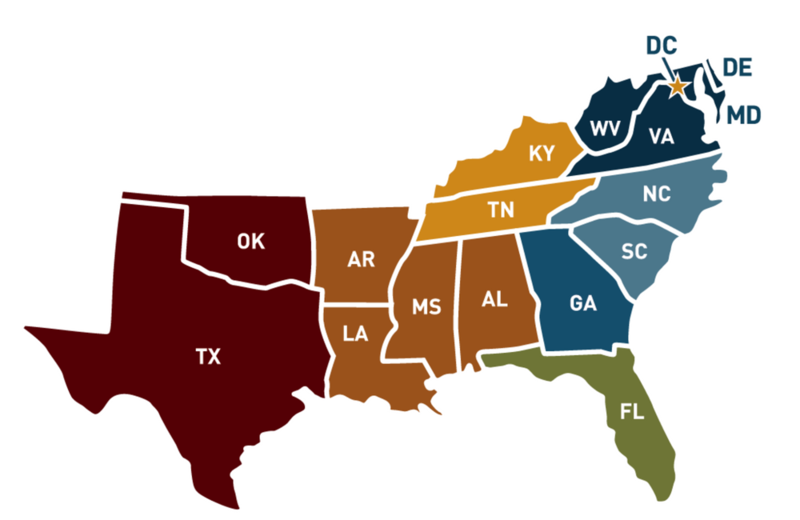 The South, as defined by the U.S. Census Bureau, covers 16 states with over 100 million people. Culturally diverse, rich in history, and geographically exceptional. America’s first Spanish and English settlements were in St. Augustine and Jamestown. The South’s political kaleidoscope includes bright blue Washington, DC, and reliably red Texas. Nashville is the capital of country music, Mississippi’s the birthplace of the blues, New Orleans gave us jazz, and Miami is the capital of Latin America (¡más o menos!). The South is the fastest-growing region in the country and beckons with opportunity. We're proud to be Southern Teachers—since 1902. • 21 of the 50 largest cities in the U.S.
• And more Independent Schools than any other region in the country.